The Aquaco MBR system is a significant leap forward in design development over traditional grey water MBR systems. The system is manufactured here in the UK, at our headquarters in East Peckham, and has been developed on the back of a decade of using the traditional MBR systems imported from Germany. 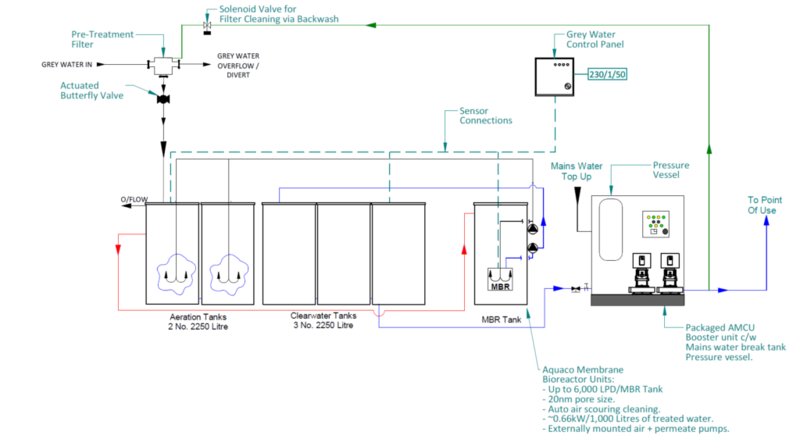 All Aquaco grey water systems are 100% compatible for integration with our Smart Attenuation, and Rainwater Top-up Systems, offering a complete building solution for water recycling, be it for BREEAM or LEED accreditation, Flood Risk Assessment compliance, or purely for water saving and economic reasons. Incoming grey water from showers, wash hand basins and baths passes through the Aquaco pre-filter, which removes any excess hair and large particulates from the grey water stack. The filter comes with built in spray bars and is supplied with a timed backwash system to be attached to the boosted treated water. The filtered outlet of the pre-filter connects to the storage tanks. The storage comprises of two tank types; firstly is the settlement tank, this is used to precipitate out silt and dense inorganic particulates. Water passes out of this small tank, via a spill pipe, into the second storage tank type; the aeration tanks. The aeration tanks are equipped with perforated EDPM aeration tubes and provide a highly oxygenated environment to promote the aerobic biological growth of bacteria. The bacteria digests suspended solids, and helps to reduce the loading on the filters. The process of aeration prevents the bacteria from respiring anaerobically, stopping any risk of fouls smells and stagnation. The water leaves the aeration tanks and enters into the MBR filtration tanks, via a spill pipe. The MBR filtration tank houses another aeration tube, continuing the oxygenation process. 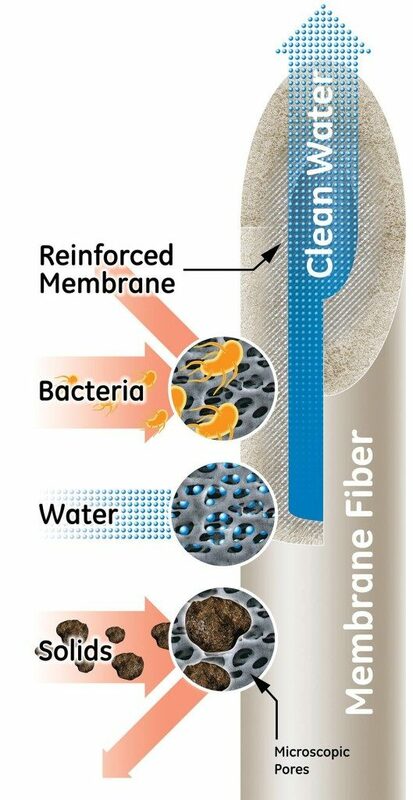 In addition to the aeration, the bubbles help to scour the membrane filter assemblies, reducing the effect of membrane fouling. The tank also contains the membrane filter assemblies where the water is drawn through the filters using the external permeate pump, attached the outside of the tank. From the MBR filtration tanks, the permeate pump, transfers the water through the filters in to the Clearwater tank, where the water is stored prior to being utilized at the point-of-use by either an Aquaco Master Control Unit packaged booster pump set, or a traditional booster set. Aquaco use All the major booster set suppliers for traditional booster use and can provide a set to suit the clients preferred supplier; Grundfos, Armstrong, KSB, Lowara etc. Animation showing the effect of the Aquaco back-washing cycle. An example of a 6,000 LPD MBR grey water system with packaged AMCU booster set. The lowest cost MBR system on the market. Lowest cost in kW/1,000 litres on the market (between 0.66-0.99kW/1,000 litres). Completely designed and manufactured in the UK by Aquaco. No EU imports, no translated manuals, and a UK based expert service team. Simplest system on the market to maintain; all pumps are external, and filters can be cleaned in situ (no confined space work for general maintenance). Bespoke and Modular design allows for design into practically any plant room given to us. Provides 50% of water requirements of most office or warehouse buildings. Can be integrated with Aquaco Rainwater, or Smart Attenuation Systems for a total water management solution. Pay back typically 3-5 years. Choose your system requirement on the right hand pane, and start a quote request. Aquaco will provide you with a quotation within 3 working days. Working with Aquaco at an early stage in your project will ensure the cheapest package solution, and we offer all our design work, 3D drawings and specification entries, free of charge. Aquaco are also available to offer full CPD training sessions with your engineers. Please contact us for further details.